Roger Baldwin was director of the National Civil Liberties Bureau (NCLB) from its founding as an organization independent of the American Union Against Militarism (AUAM) in October 1917 until his resignation in September 1918. His resignation followed a U.S. Justice Department raid on the NCLB offices on August 30, 1918, but was primarily prompted by his plan to refuse to submit to the draft. Selective service had been extended to men up to the age of 40, and Baldwin at age 36 was eligible. He was subsequently convicted of violating the selective service act and sentenced to prison. Upon leaving prison in the summer of 1919 he began the work of reorganizing the NCLB into a permanent civil liberties defense organization. 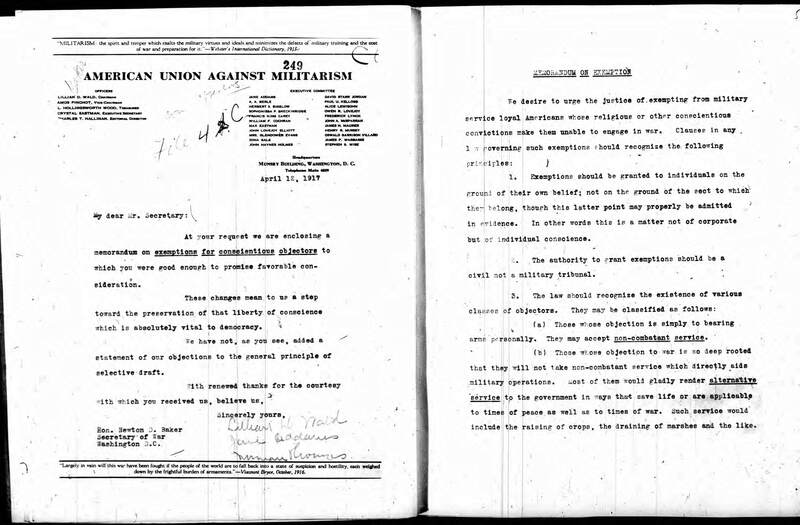 The ACLU was subsequently founded in January 1920. 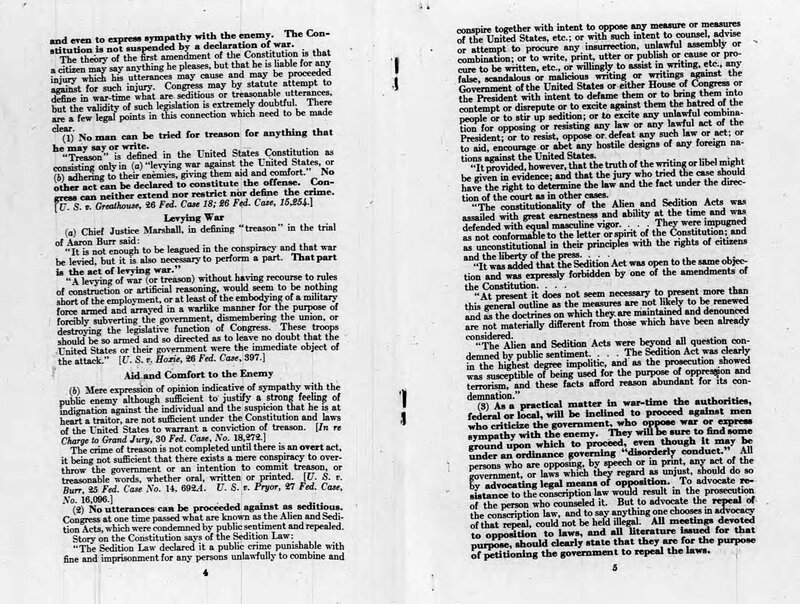 The documents in this section relate to these events. 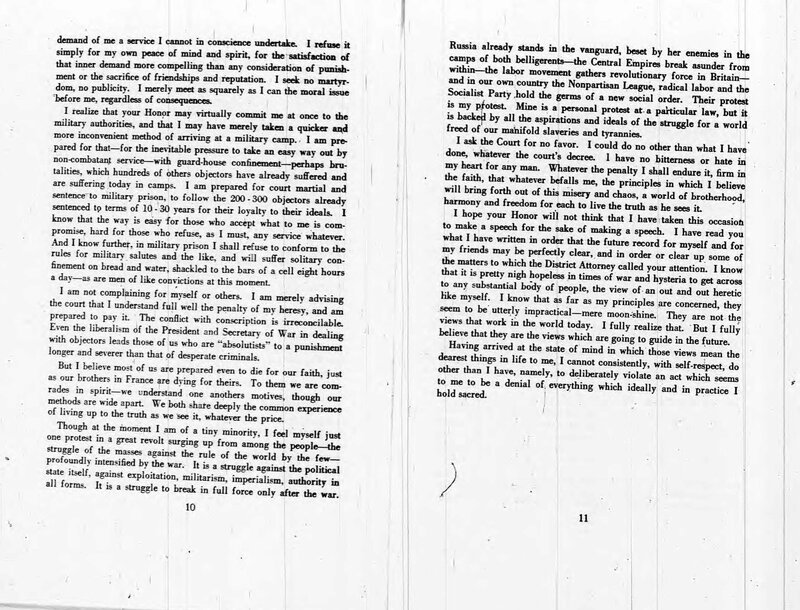 Particularly important is Baldwin’s statement to the judge upon being sentenced to prison, which was widely circulated and helped to establish Baldwin’s national reputation (Document # 3). With this September 6, 1918 letter, Roger Baldwin resigns as director of the National Civil Liberties Bureau. 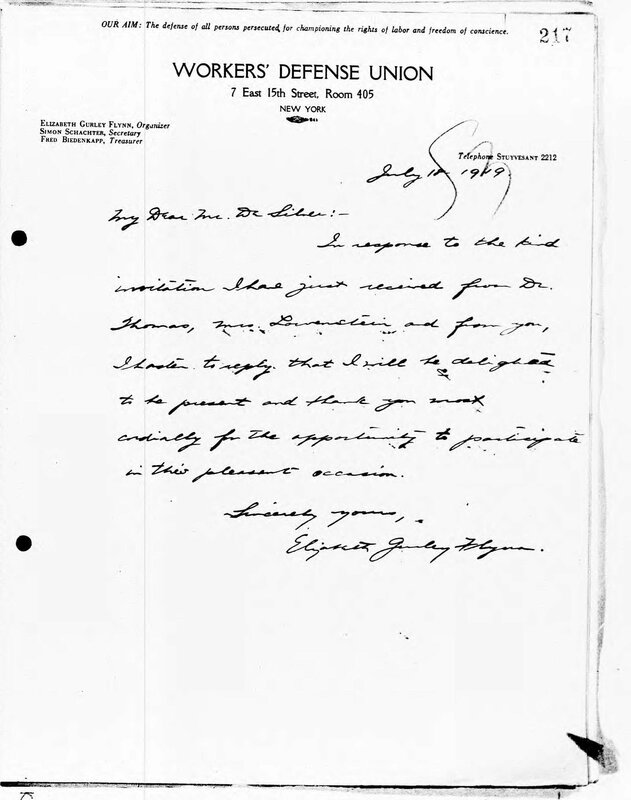 The letter refers to the U.S. Justice Department raid on the NCLB offices on August 30th and the possibility of the prosecution of NCLB leaders under the Espionage Act. The primary reason for his resignation, however, was the fact that he had bee served with a draft notice and planned to refuse to submit to military service. Selective Service had recently been extended to men up to the age of 40, and he was now eligible. 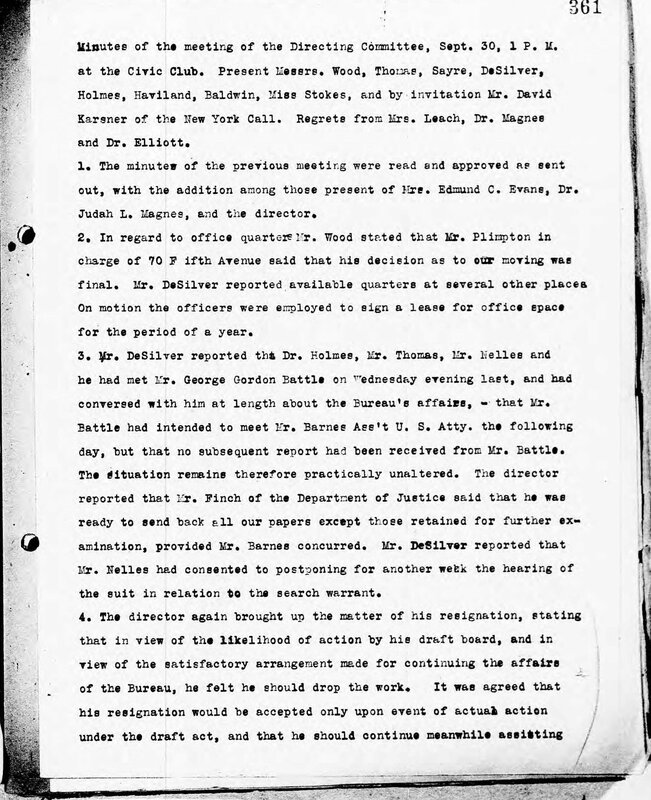 The September 30, 1918 Minutes of the NCLB Directing Committee discuss Baldwin’s situation with the draft and the organization’s response (Agenda Item # 4). The minutes also cover the NCLB’s eviction from its office at 70 Fifth Avenue, which was probably due to government or public pressure. The landlord, Mr. Plimpton, is a relative of George Plimpton who was a noted editor and author in the 1950s and 1960s. 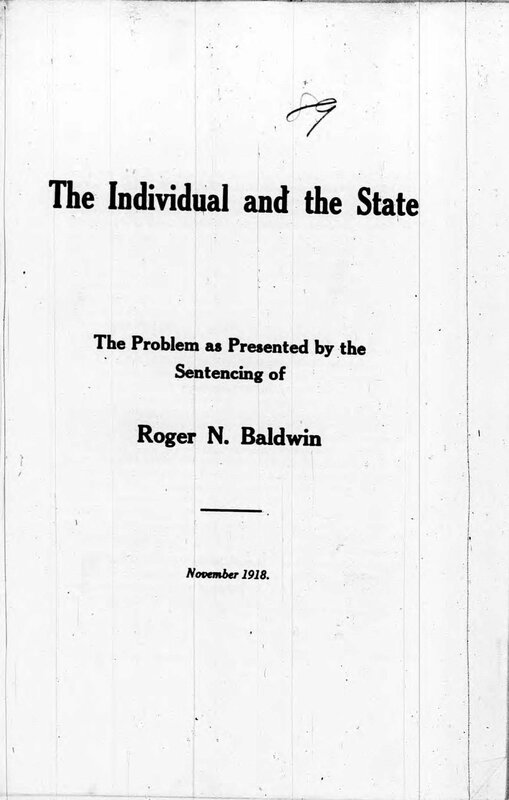 The Individual and the State(November 1918) is a reprint of Roger Baldwin’s statement to Judge Julius Mayer on October 30, 1918, upon being sentenced to prison for refusing to submit to the draft. 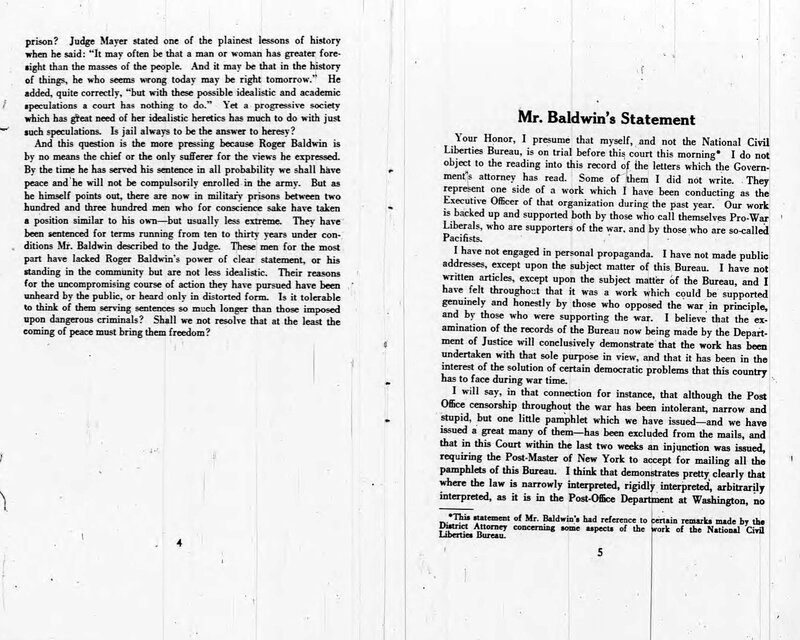 Baldwin’s statement immediately attracted attention, was widely quoted and reprinted, and established Baldwin’s national reputation as a person of conscience. 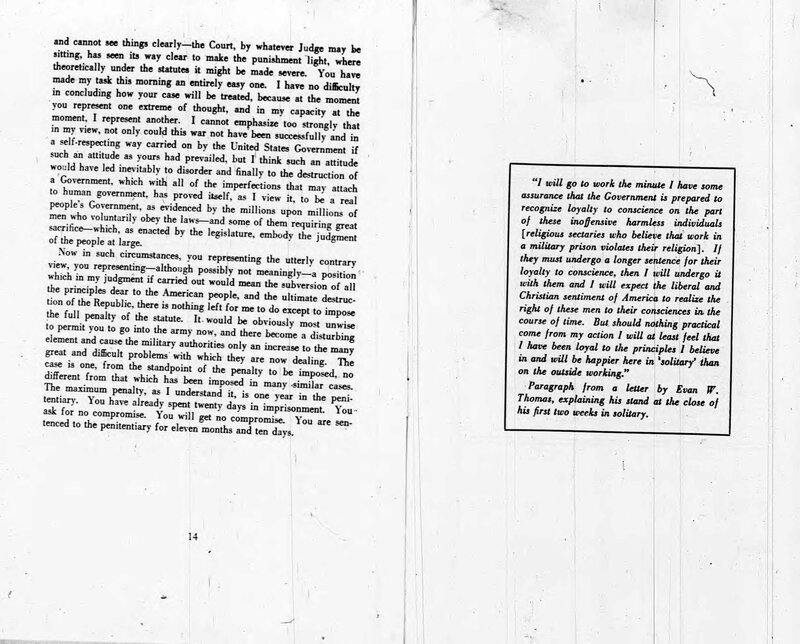 This version was reprinted and distributed by the NCLB. 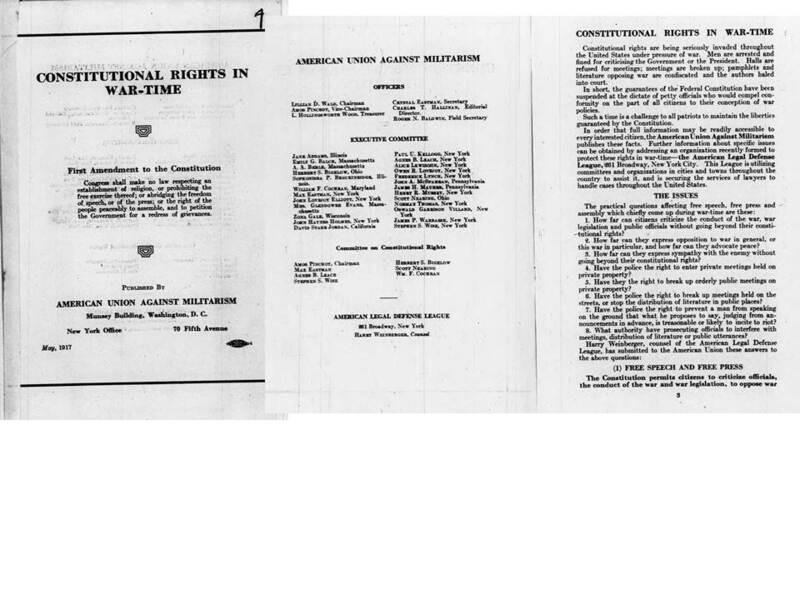 It was reprinted during World War II when the issue of conscientious objection to participation in war reappeared. 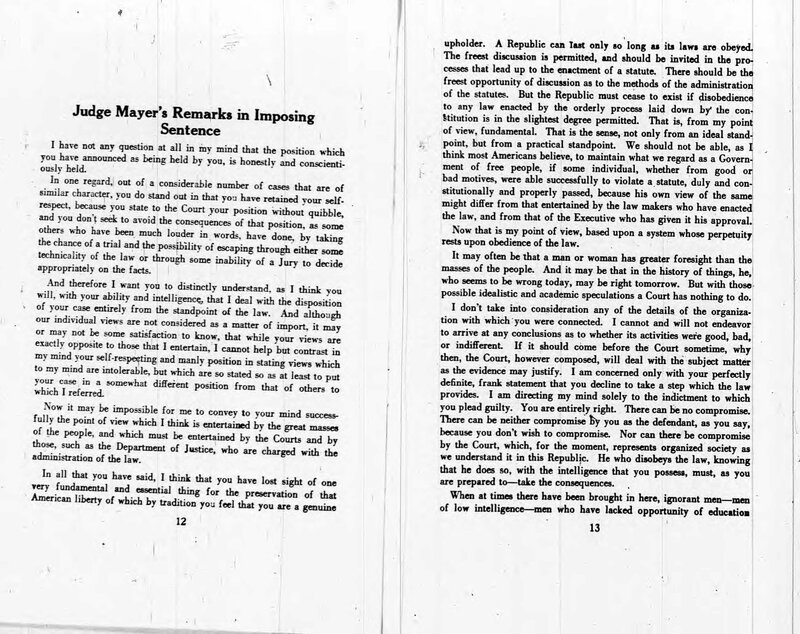 This pamphlet also includes Judge Mayer’s response to Baldwin and pronouncement of the sentence. 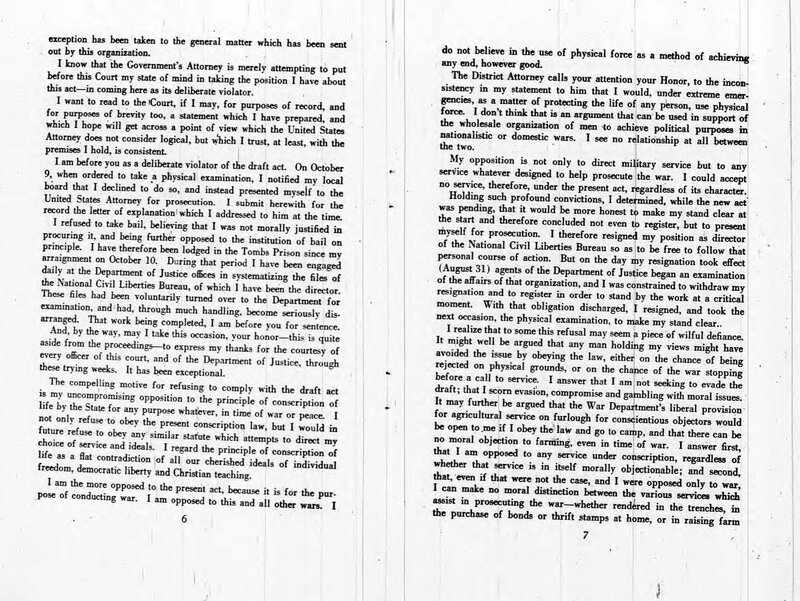 These Minutes of a special meeting of the NCLB Directing Committee on October 31, 1918, immediately after Baldwin’s sentencing, record the discussion of possibly publishing Baldwin’s speech to the court. 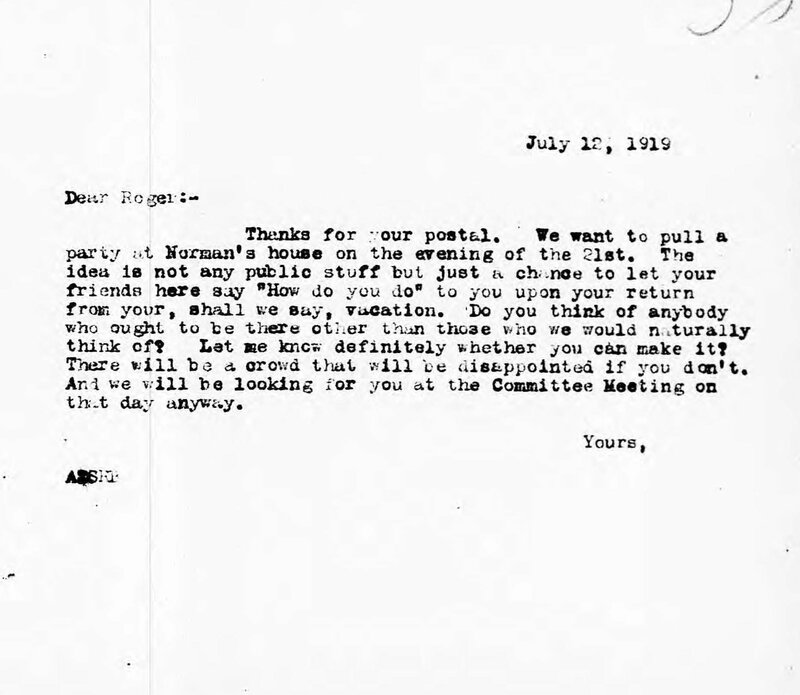 The committee decided not to, and hoped that his friends would publish it privately. 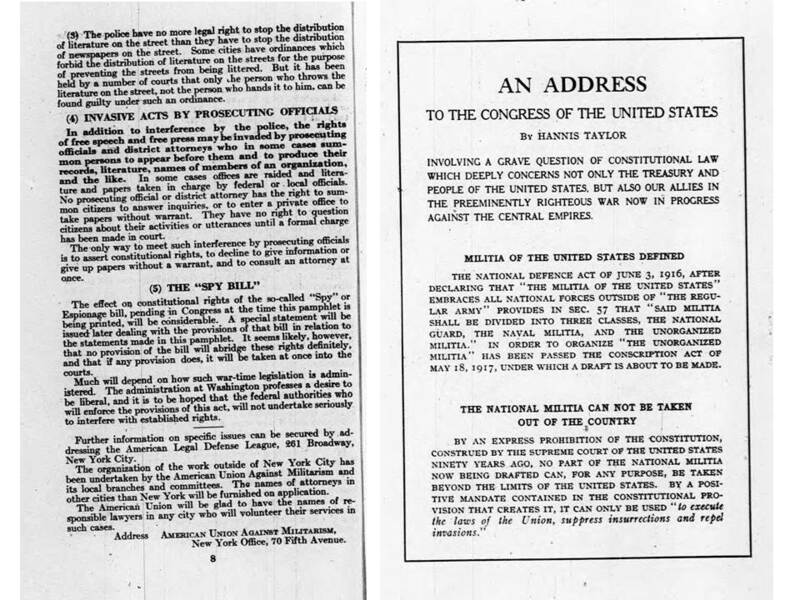 The NCLB changed its mind and published and distributed the speech. 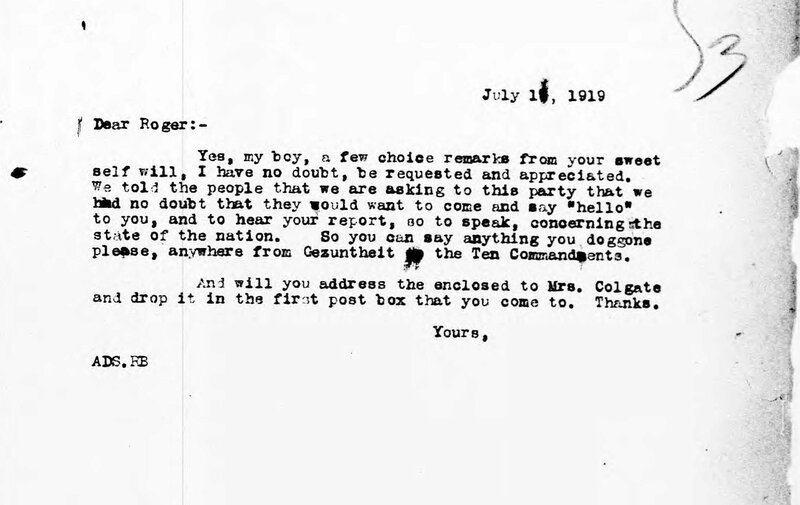 The first letter, from the NCLB letter to its members, February 21, 1919, includes a letter from Roger Baldwin, who was then in prison for refusing to submit to the draft. In addition to discussing the pending peacetime sedition bill and amnesty for conscientious objectors in prison, he declares that he would not accept any personal pardon that would allow him to be released from prison early. 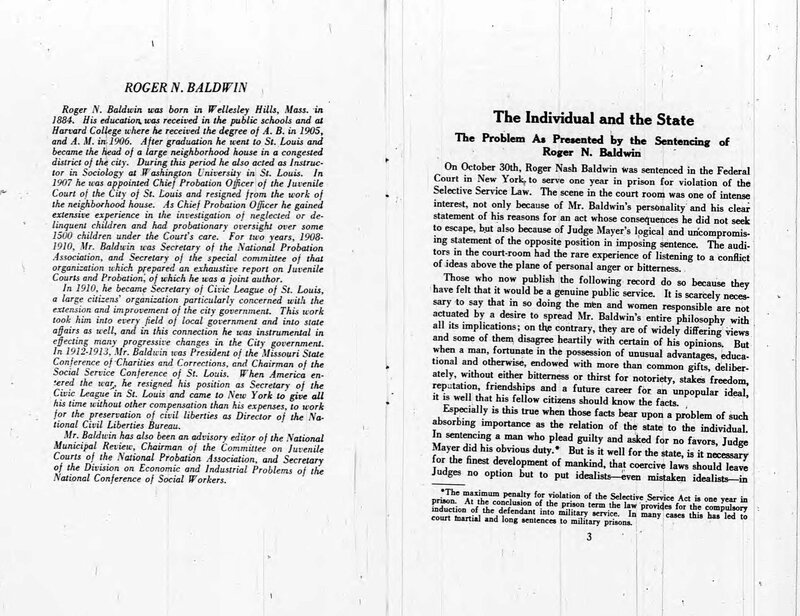 The second letter, undated, is from Baldwin to Albert De Silver objecting to any efforts to obtain a pardon for him. 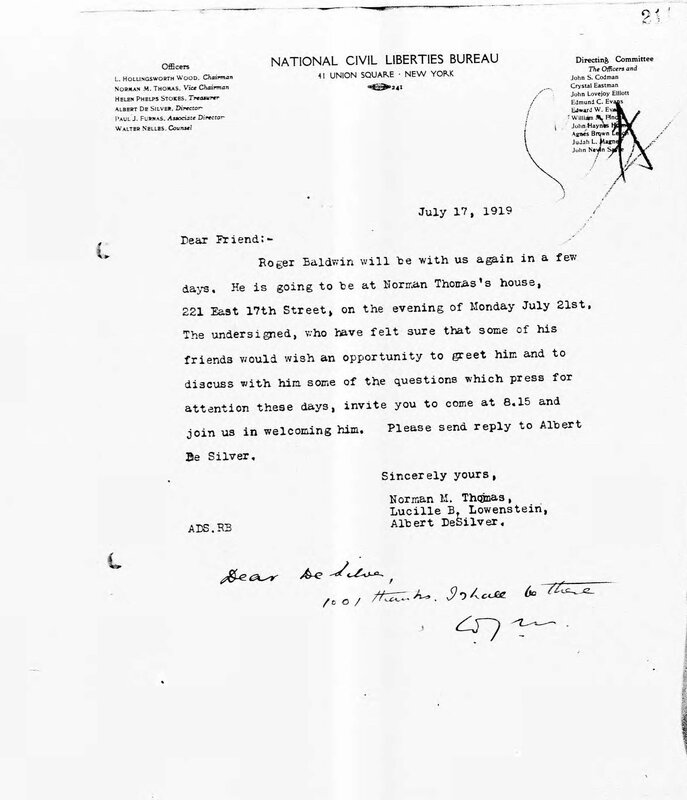 These letters from Albert De Silver to Baldwin on July 12, 1919 and July 13(not clear) discuss plans for a welcome home party following his release from prison, to be held at the apartment of Norman Thomas. 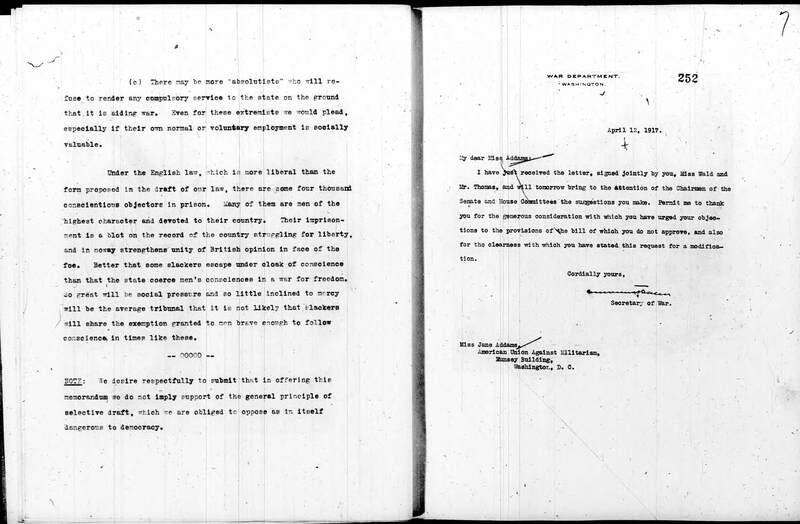 The formal invitation to the welcome home party for Baldwin from Norman Thomas, July 17, 1919. The famous radical Elizabeth Gurley Flynn accepts invitation to the welcome home party for Baldwin, July 18, 1919. Baldwin and Flynn were close colleagues in these years. In 1940, however, they had a falling out when Baldwin engineered the adoption of an ACLU policy barring members of totalitarian organizations from serving in official ACLU positions, forcing her expulsion from the ACLU Board of Directors. The caterer’s bill for the welcome home party for Roger Baldwin at Norman Thomas’s apartment. 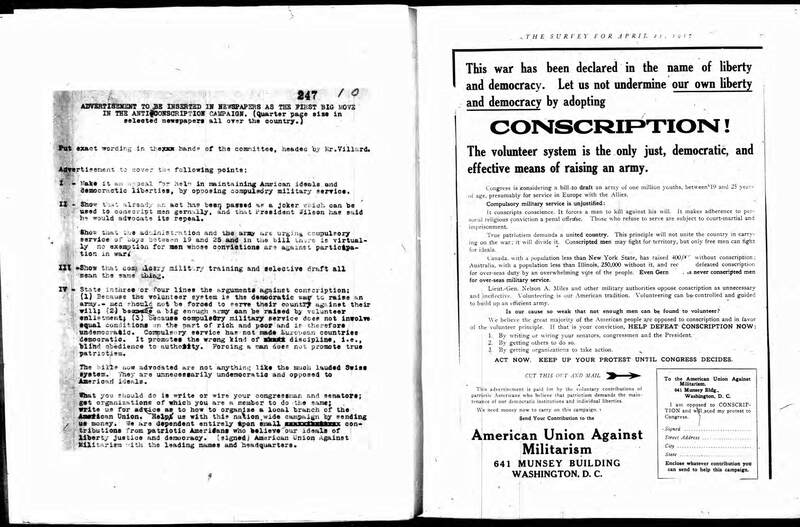 Today, we begin a series of blog entries in a new category American Civil Liberties Union History covering the ALCU’s early history. 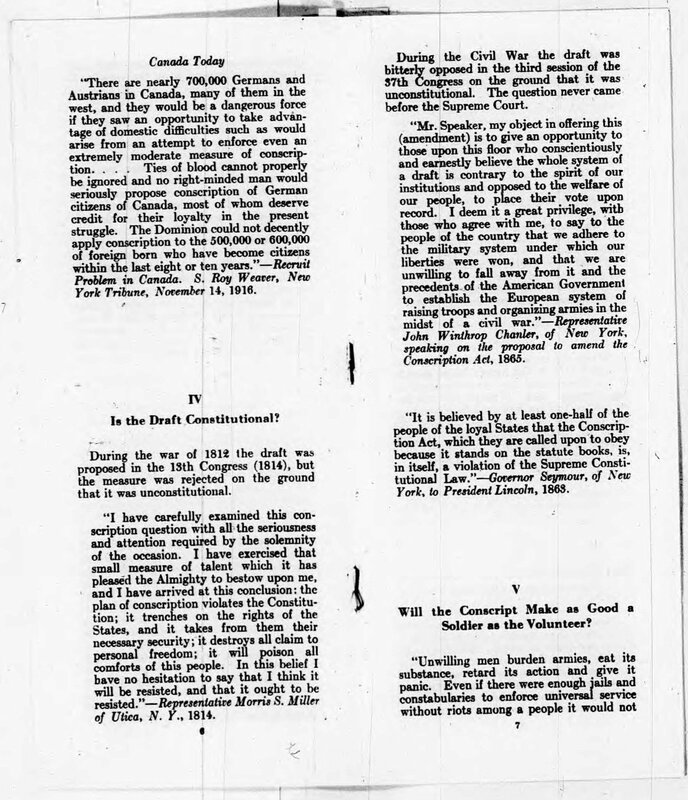 Written by Samuel Walker, a professor emeritus in the School of Criminal Justice at the University of Nebraska at Omaha and the author of the only comprehensive history of the ACLU, each entry contains many digitized documents along with Walker’s commentary. These documents are part of 20 reels of microfilm that we digitized recently with Walker’s generous support and can be accessed here. 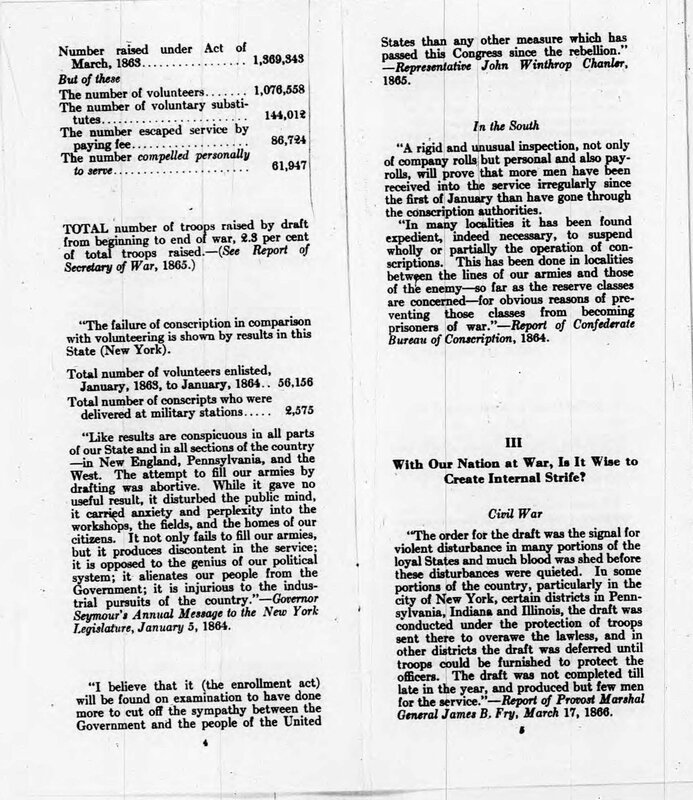 A note on the citations to the ACLU Records: The location of each document is indicated by the microfilm reel number, the original Volume number in the ACLU Records, and the page number(s) within each volume. Locating particular documents should be fairly easy, although it will often require moving back and forth between reels and volumes. Documents on particular topics are often scattered among different microfilm reels and volume numbers. 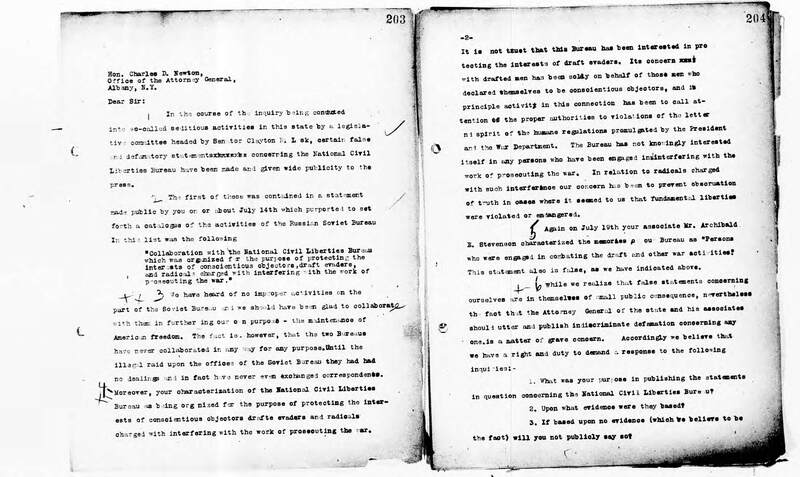 This is believed to be a result of the disorganization of the records that occurred when the U.S. Justice Department raided the offices of the National Civil Liberties Bureau on August 30, 1918. 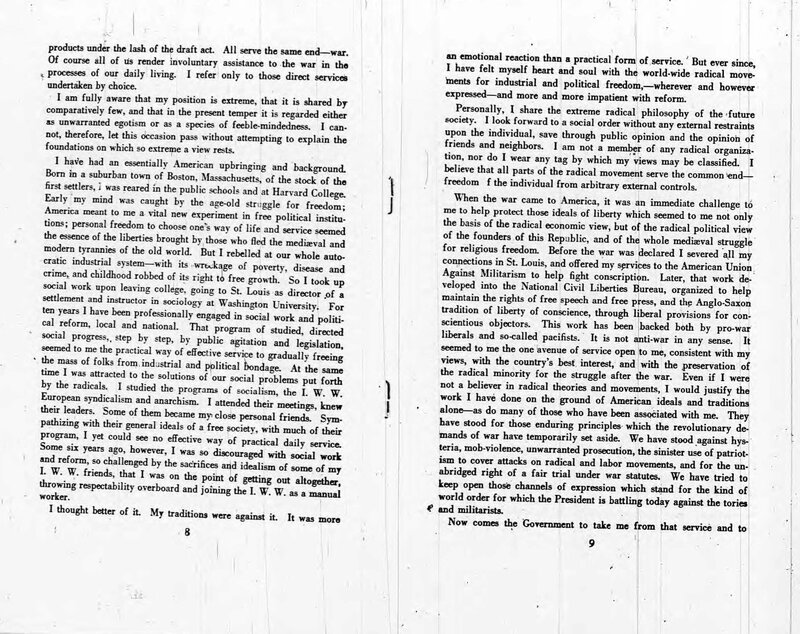 Despite the disorganization of the documents, however, most are grouped together in a logical fashion. 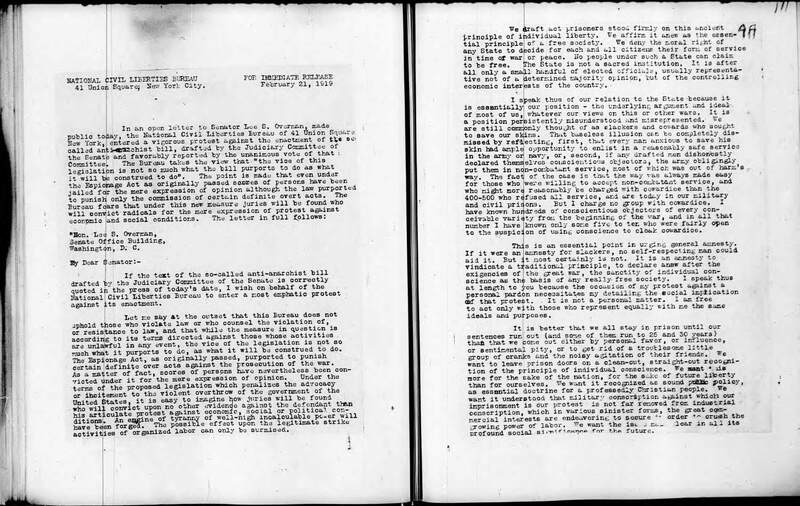 As a result, readers who access a document related to the founding of the National Civil Liberties Bureau (NCLB), for example, will find related documents on that subject nearby, and these documents may be of interest to readers. A disclaimer: the text is Professor Walker’s interpretation of ACLU history and some will not agree with it. This is the nature of historical scholarship, but we encourage you to comment and, where possible, cite other ACLU documents that you find online. World War I ended on November 11, 1918, but the repression of civil liberties continued unabated. The most well-known event was the so-called “Palmer Raids,” which actually involved two sets of federal mass arrests of alleged radicals, in November 1919 and early January 1920. The leaders of the NCLB began thinking about transforming the organization into a permanent one devoted to the defense of civil liberties. The key person was Roger Baldwin, who was convicted of violating the Selective Service Act in October 1918 and sent to prison. After his release in the summer of 1919, he made a cross country trip to work as an industrial laborer. Upon his return to New York in late 1919 he began the planning for the new organization, which was established as the American Civil Liberties Union (ACLU) in January 1920. 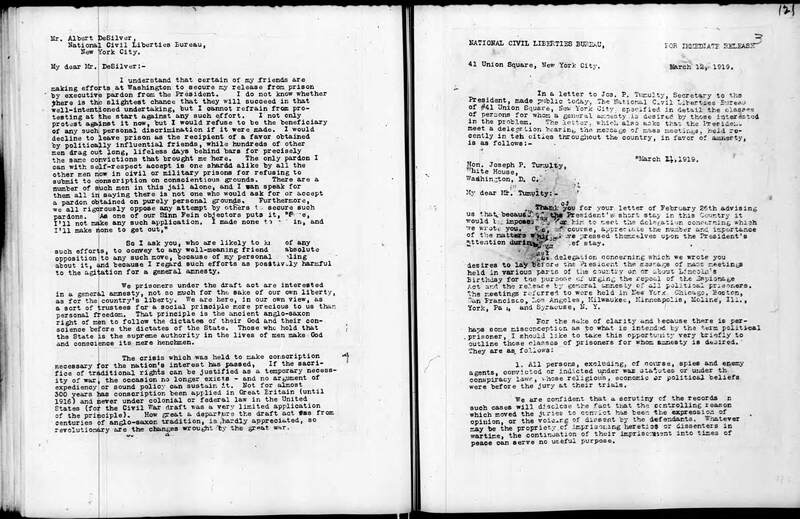 This undated and unsigned memorandum, Suggestions for Reorganization of the National Civil Liberties Bureau, was probably written by Roger Baldwin (see his initials in the upper right hand corner), probably in late 1919. It represent his thoughts on reorganizing the National Civil Liberties Bureau into a permanent civil liberties organization. Note that in the first paragraph the primary focus is on working people (“the cause we serve is labor”). No name for a permanent organization is suggested at this time. 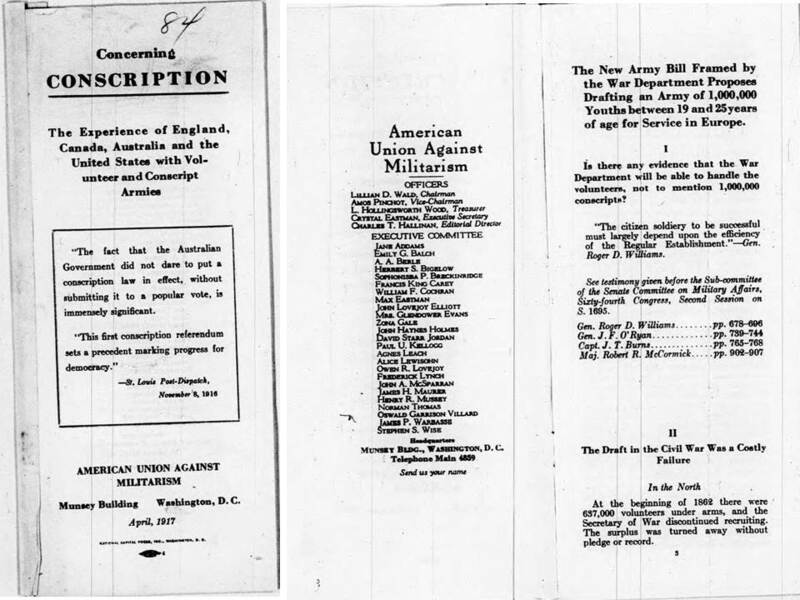 When the ACLU is officially constituted, it is evident that discussions about the agenda for a national organization had expanded to include a broader range of civil liberties issues. 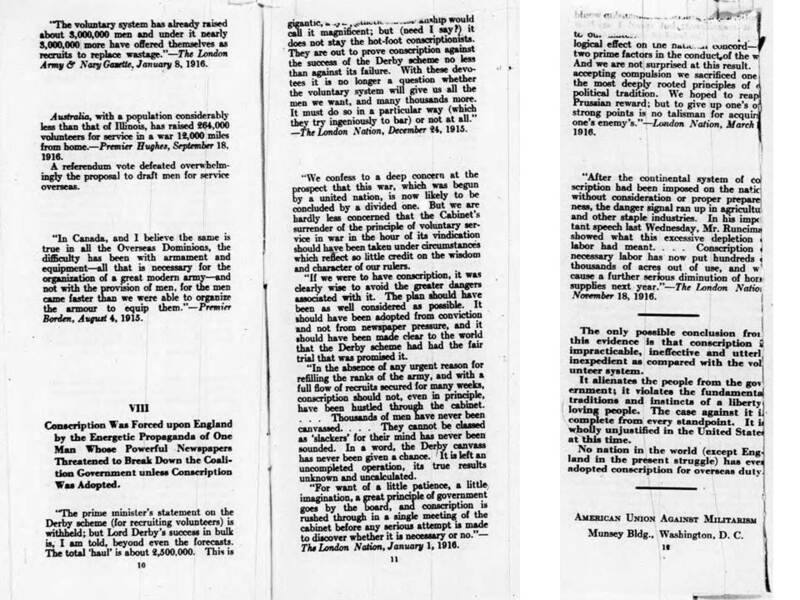 This undated memorandum by Roger Baldwin was probably written in early January 1920 and summarizes the work of the NCLB from October 1917 to January 1920. It was undoubtedly written as part of the discussions to reconstitute the NCLB into a permanent civil liberties organization. 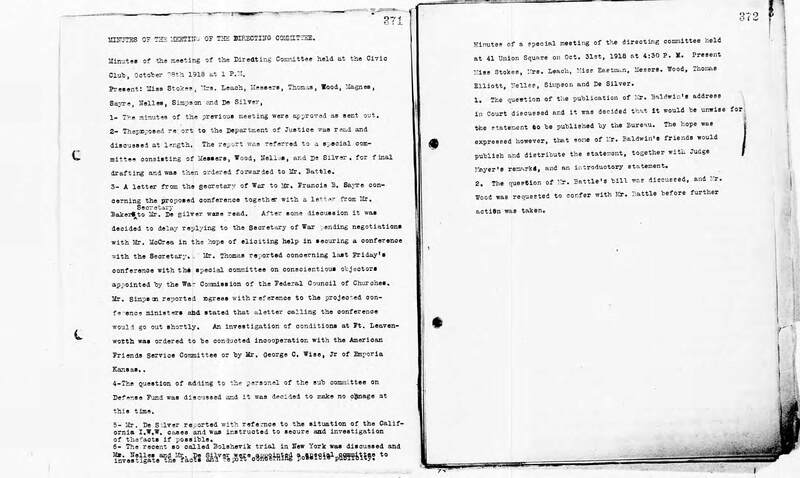 The decision to create the American Civil Liberties Union is recorded in these Minutes of the Conference to Reorganize the National Civil Liberties Bureau, January 12, 1920. 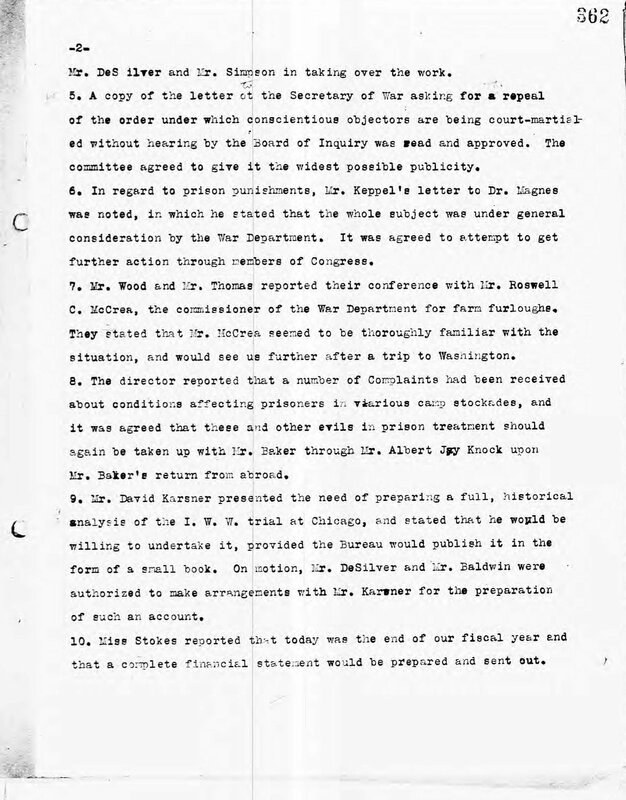 Note the concern (Item #3) about including the names of Roger Baldwin and Elizabeth Gurley Flynn because they had been prosecuted and convicted of federal crimes during the war. The objections were rejected, and their names were included. 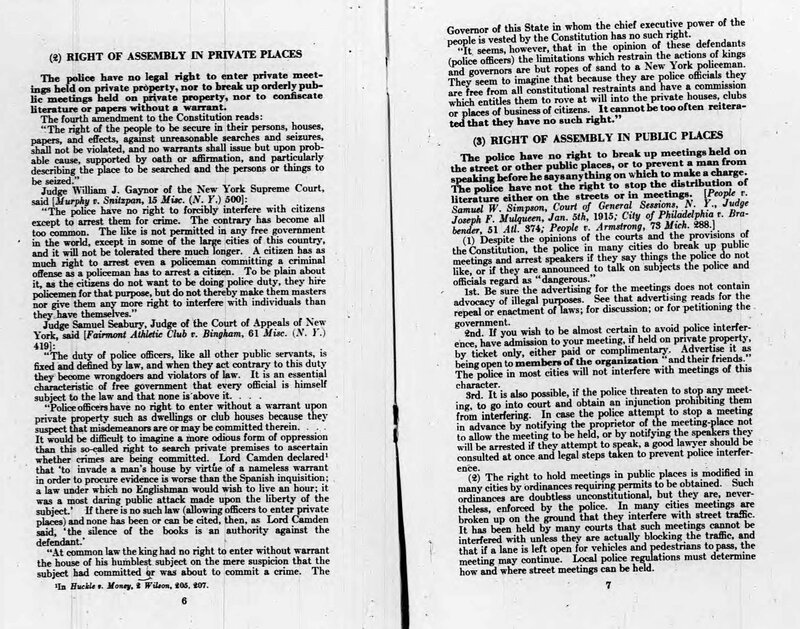 The first action by the new ACLU was to protest the proposed peacetime sedition law being considered by the House of Representatives (Item #7). 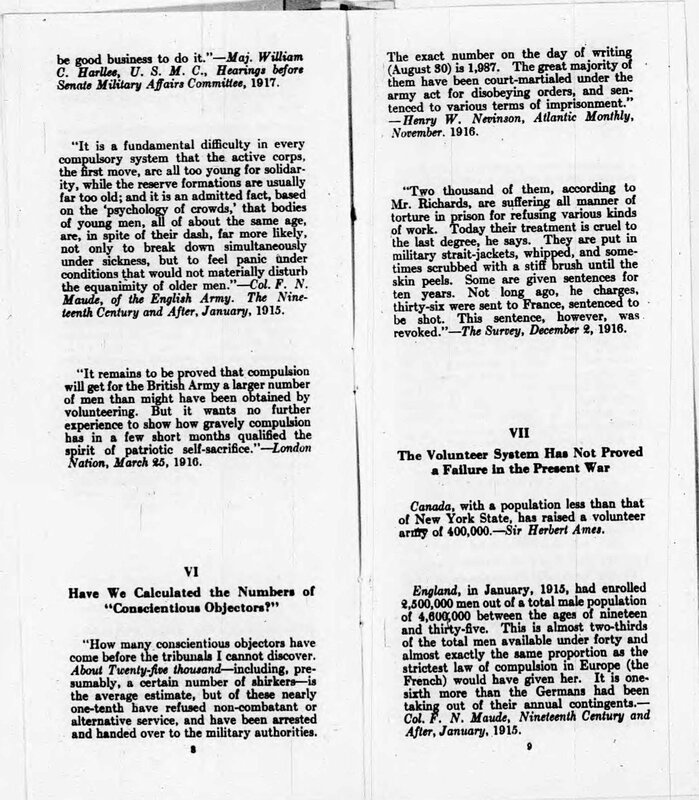 The 1918 sedition law had expired with the end of the war, but the proposed peacetime law did not pass. We also welcomed a new staff member to the project this summer, David Gillespie. 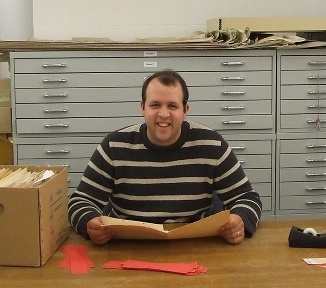 Dave has a background in American and military history, with varied archival experience including research assistant at the Strategic Studies Institute, intern at the Gettysburg National Military Park Archives, and intern on the House Divided project creating a digital collection on Dickinson College during the Civil War Era. On the ACLU project, he is responsible for reviewing the legal case files within the collection for any restricted materials, which account for about 65% of the records. Through this review, we expect to be able to open the majority of these materials on July 1.